Up until recently, the term “paid media” was, for all intents and purposes, a less fancier name for advertising. Frankly, for public relations professionals, it would have almost been taboo to even begin to suggest paying for content, seeing as by traditional standards we have always worked to differentiate ourselves from our marketing constituents. But times they are a changin’ and thankfully, so is that outdated, bleak corporate mindset. In an age where digital media is the fastest and most efficient way for consumers to digest their news, the concept of paid, owned and earned media has evolved — disrupting the traditional online marketing landscape. What were once separate notions of media can be integrated in new ways to better serve brands and consumers. As a result, savvy public relations specialists are taking the lead in re-evaluating the ability of paid media to serve as a vehicle to amplify the impact of earned and owned media rather than viewing each channel as a separate and totally disconnected effort. Check out a few of these cool infographics and useful articles that break down the barriers to each channel and demonstrate how each tactic can intersect to ensure your messages are being delivered to the right audiences. 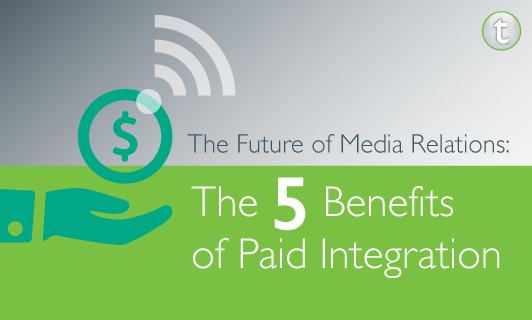 What exactly is a paid integration? There are several different types of paid integrations but to put it into simplest terms, it’s when a brand pays to place its message/content in front of an audience that someone else has assembled. In the PR world, this would likely include content-enriched paid placements such as customized editorial content (advertorials and blog posts), broadcast sponsorships, personalized online campaigns and webinars. So, why paid integration and why now? Here are just a few of the benefits of integrating paid media placements into a brand’s overall PR strategy and how it can bolster consumer exposure. Paid media can be used to deliver a brand’s content to its targeted audience in case it is not seen through organic (earned) placements alone. Choosing to place an ad on social media platforms like Facebook or Twitter gains brand presence in high-traffic channels where consumers/buyers spend their time. No other type of media can guarantee the immediacy, scale and reach that paid media can deliver. Through the use of paid media integration, a company can have complete control of its brand message and content. One fact will always remain, consumers don’t differentiate media. In order to make a brand relevant in today’s complex media landscape, PR specialists must actively engage with its target audience, and the overall impact on the consumer is that much stronger when a well-orchestrated, integrated media strategy is in place.